I know I'm late on this. I don't much care. I went with some friends this year, just went without much of a plan. And it worked out, amazingly enough. We saw Paper Heart, with Michael Cera (of Arrested Development fame) and Charlyne Yi. When the presenter stood to introduce the film, he said the Sundance screeners had a hard time defining which genre this would fit in. Strange, it seemed to me, that people with such extensive experience would have a hard time with that. They must know every genre, sub-genre, and cult niche there is. But after seeing Paper Heart, that problem made more sense. The story centers around Charlyne Yi (played by Charlyne Yi) on her search for love. Not for herself, mind you, just love anywhere. She doubts it's very existence. So Charlyne and the film crew goon the road to see if they can locate actual, true love. A variety of people are interviewed, from a divorcee, to aged grandparents, to a gay couple in New York, to children on the playground. The interviews are genuine and genuinely entertaining. Their authenticity is warming, capturing the unscripted heart of each subject. A good documentary does that. But, this isn't any documentary. In fact, it might not be a documentary at all, depending on the stricness of your definition. On the road, Charlyne meets Michael Cera (played by Michael Cera), and romance buds. Charlyne, ever the skeptic, might be turned by Michael's soft spoken wit. But this part is scripted. So, documentary? Drama? Comedy? It is very funny, for sure. This is one of the strangest blendings since Shaun of the Dead, a romantic zombie comedy (rom-zom-com, for those in the know). What do we call Paper Heart, then? A Docu-dramedy? Whatever you call it, you'll love it. It was a good movie, on a subject everybody knows in one way or another. You'll be happy you saw it. The second viewing was a little more challenging. 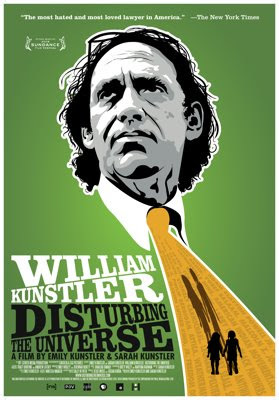 We saw William Kunstler: Disturbing the Universe. Kunstler was maybe the most controversial attorney of the second half of the 20th century. His clientel ranged from now renowned civil rights pioneers to known terrorists, from openly persecuted American Indians to incorrigible hippies. There seemed to be no rhyme or reason to his choice of cases, though later on in his career, he tended toward higher profile defendants. Part of what made the film interesting was not only the subject, but the perspective. The biopic was written, directed, and edited by Kunstlers daughters, Emily and Sarah Kunstler. The duo prove an able pair. They know the subject well, and included many home videos. They also had the advantage of countless documents and archival footage of their father at rallys, on marches, and in media interviews. Kunstler vacillates between hero and monster. He never pauses for long, and you're never sure where he is headed. Probably the most stirring part of this sometimes poignant documentary is a speech he makes near the end. It's simply footage of Kunstler speaking at a rally. He explains that legality is not the end all of right and wrong. Six million jJews killed during the holocaust. Legal. Jesus lifted on a cross to die. Legal. In short, it was fascinating. 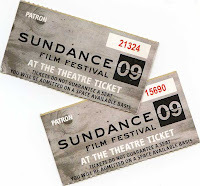 But part of the fun of Sundance, of course, is the convergence of so many film makers. We weren't disappointed this year. Director Nicholas Jasenovec, actor Michael Cera, actor Jake M. Johnson, who played Nicholas Jasenovec in the movie (I know, it's confusing), Charlyne, and...some other guy. D. Smith got this shot, and thinks it's too sharp a portrait to be believable. No, really, he's a real celebrity, folks. The crew behind William Kunstler: Disturbing the Universe. Looks like a nice guy, right? Maybe he is, but he's also a bit of a loon. Every time the mic was in front of him, he would start pushing for abortion and Communism. One of Kunstler's former clients, arrested for burning the American flag outside the Republican National Convention in 1980. Hated, hated Reagan. Funny, because we were sitting on the second row, and I was wearing my Ronald Reagan tee shirt. No joke. I'm not an Arrested Development watcher, but isn't he the guy in Juno, too? Anyway, looks like a really fun Docu-dramedy. That's like you to wear your Reagan shirt in front of the Reagan haters, anyway. You're fearless! Glad it worked out that you got to go even without a plan and enjoyed the experience. Lots of wierd people out there in movie land.